Learn how to quickly delete all tweets from your Twitter account. With these web based and free services, you can easily remove all the Twitter messages that you have ever posted on your timeline. Twitter was created in 2006 as a short messaging system for small groups. Since then Twitter has come a long way and has evolved into a powerful communication tool. It has dramatically changed how information is shared and spread online. One fine day you realize that you have been tweeting since long and have outgrown them, regret your opinion on controversial subjects, you only re-tweet, or only chat or may be your tweet has too many links, whatever the reason you have decided to delete all past tweets. Can you really delete all tweets and start afresh on Twitter without losing your followers or username? Yes you can! There are quite a few popular free web tools available, that can help you delete all your tweets and start on Twitter with a blank slate. Keep in mind there is no going back once you have deleted your tweets. If you think you may want to save them beforehand — you should check Backupify. It automatically performs scheduled backups at the online services they support. It offers Twitter backups for free and three additional premium plans, depending on how much storage you need. Therefore, it is strongly recommended that you download an archive of your tweet history before you start deleting your tweets. TwitWipe is a free service that helps you delete your tweets in one go. If the total number of tweets to delete is 3,200 or less then the tool can delete all the tweets with a single click. If your tweets exceed 3,200 then it needs to be deleted manually. Open your browser and go to twitwipe.com. Click the Get started Scroll down, complete the captcha and click on Proceed. If you have signed in to Twitter, this site will ask you for permission. Click Authorize app. The action redirects you to Twitter. You will find a message asking you to confirm that you want to wipe all your tweets. Click Yes to confirm. Ensure that you do not close the web page. Once the process is complete, you will be able to sign out of the app. Remember, the deletion is permanent and depending on the number of tweets, the deletion process may take some time. The green bar displays the tool’s progress and when the process is complete it displays a message “Looks like you’re all done”. Go to https://twitter.com/settings/applications. You will see a list of apps that have access to your account. 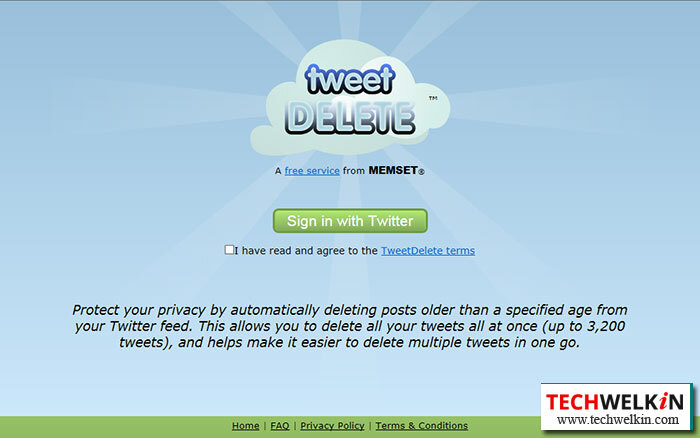 TweetDelete is also a service for Twitter users. It allows you to automatically delete your Twitter posts that are older than a maximum age that you specify. 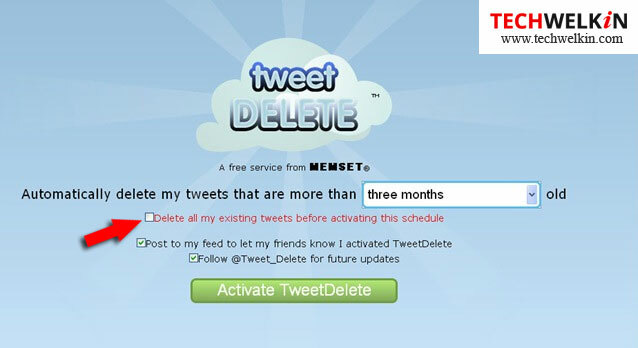 TweetDelete can only delete the latest 3,200 tweets on your account. Tweets older than this are not easily accessible via Twitter’s interface and so the tool cannot delete them. Go to http://www.tweetdelete.net and select the checkbox to agree to the terms. Click Authorize app. Choose a time span from the dropdown menu. Here you can choose the tweets to delete based on their age. You can choose from options spanning from a week to a year. Click the box next to Delete all my existing tweets. De-select the checkbox Post to my feed… to prevent TweetDelete to send a tweet on your behalf, announcing that you have used the service. If you don’t want to follow TweetDelete on Twitter, de-select the checkbox Follow @Tweet_Delete for future updates. Click Activate TweetDelete. TweetDelete will now delete all the tweets within the selected time span. After the tweets are deleted, go to https://twitter.com/settings/applications and click Revoke Access next to TweetDelete. This will disable the connection between TweetDelete and Twitter. 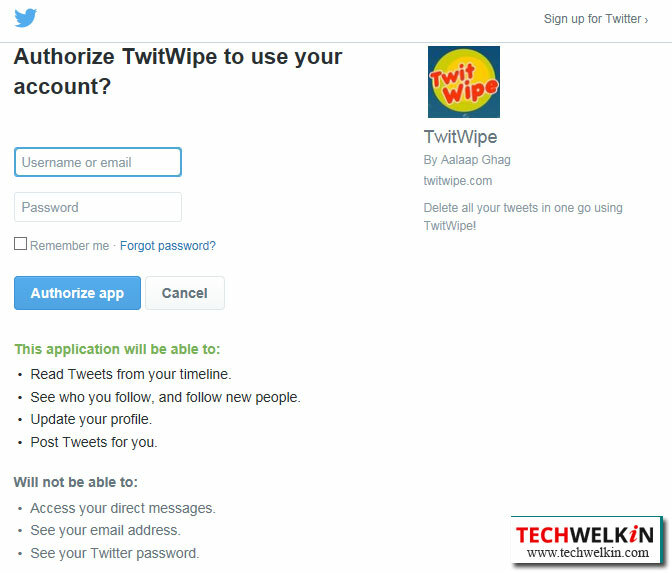 Sign in to Twitter and click Authorize app. You can now scroll through your tweets and point out the ones that you want to delete. The tweets can be sorted by date, the number of retweets, replies, and also look for tweets that contain specific words, usernames or hashtags. After identifying the batch of tweets to delete, click on the Delete Tweets You will be prompted to confirm the deletion. Click the corresponding button to confirm. A progress bar will appear in the top-right corner of the screen, displaying the number of tweets deleted. You can delete in multiple batches. The progress bar will show the combined progress of all the batches selected to delete. Depending on the number of tweets to be deleted, the process may take some time. If you are not too keen to sort the tweets to delete then click the Delete All button to delete all your tweets at one go. After the tweets are deleted, go to https://twitter.com/settings/applications and Click Revoke Access next to Cardigan. This will disable the connection between Cardigan and Twitter. TweetEraser is a simple web-based tool and helps you to filter and delete your tweets. This app too works for the most recent 3200 tweets. Sign in with Twitter and click Authorize App. It will redirect the page to Twitter. Click on the plus icon to select all the tweets from the search list or you can randomly pick few tweets that you may want to delete and click the corresponding delete button. When prompted to confirm click Delete Permanently. After deleting the tweets, go to https://twitter.com/settings/applications and click Revoke Access next to TweetEraser. This will disable the connection between TweetEraser and Twitter. Auto Delete: deletes tweets older than your set limit of day or by leaving only certain number of tweets. It means it will delete the older tweets and retain the latest ones. Archive Upload: this feature allows you to search and delete all your tweets without limitations. The feature is available only in premium version of the app. Full Delete: deletes all your tweets at once. This feature is available only in premium version of the app. Search for the tweets to be deleted. You can delete all the tweets that match your search criteria or you can delete selectively by clicking the checkbox against each tweet. Click the corresponding delete button to delete the tweets. After deleting the tweets, go to https://twitter.com/settings/applications and click Revoke Access next to TweetDelete This will disable the connection between TweetDeleter and Twitter. Twitlan – Twitlan helps delete selective tweets. The app loads up to 200 tweets at a time. Twitter Archive Eraser – supported only on Windows. You need to download the Twitter Archive. The tweet ID of all your tweets resides in this archive. This makes possible for the app to locate all the tweets without any restrictions. Follow the instructions on how to download the app and use it on this page. Why these tools can delete only 3200 tweets? It is believed that you can only access the most recent 3200 of your tweets. It is not true Twitter allows all tweets to be searchable. However, Twitter limits the number of tweets that can appear on your timeline and does not allow third-party apps to search past your most recent 3200 tweets. What happens to deleted tweets? After a bulk delete, it may take some time to reflect the changes. If other users have quoted your Tweet in their Tweets it will not be deleted. If other users re-tweet your Tweet, with a comment of their own, their Tweets will not be deleted. Tweets may be cached or cross-posted on third-party websites, applications, or search engines. Tweets that are not on Twitter cannot be deleted. NOTE: Do not forget to click the Revoke Access button next to each of the Tweet Delete apps you tried and next to any other apps you have approved over time but no longer use. Giving access to your account to apps you do not use and do not monitor, is a bigger security risk than storing years worth of old Tweets.